Crispy and flavorful baked chicken wings are so easy to prepare and you don’t have to bother with all the grease from frying! 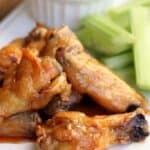 With Sunday being the official kick-off to football season and all, do the men in your life a favor and make these crispy baked chicken wings!! Seriously, these little guys are the bomb.com –soo easy to prepare since they’re baked instead of fried (and not to mention way healthier too!) and they taste fantastic! They’re baked first, to crispy perfection, and then tossed in the most delicious sweet/spicy sauce that’s kinda like the sauce you’d get at Wingers. They’re totally addicting and perfect for game day! Make them–>ASAP. Thank me–> later! 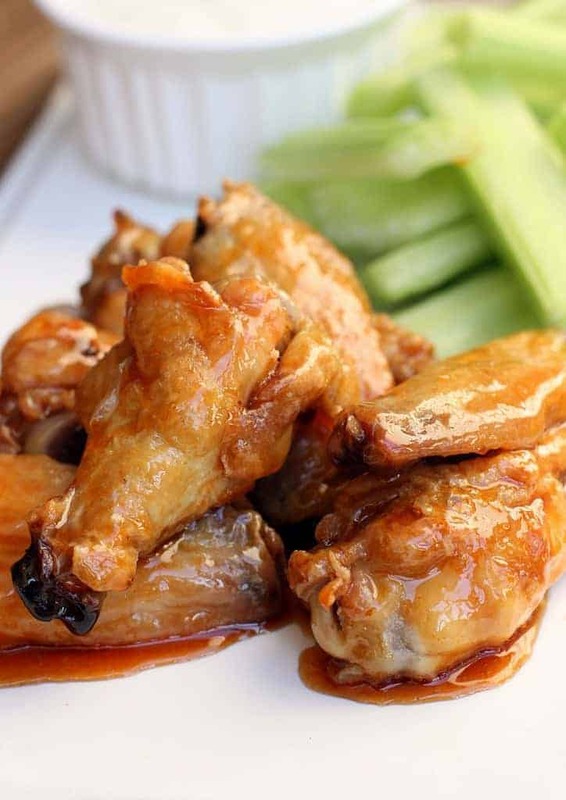 Crispy and flavorful baked chicken wings are so easy to prepare and you don't have to bother with all the grease from frying! Adjust your oven racks to the upper-middle and lower-middle positions. Preheat oven to 250 degrees F.
Line a baking sheet with aluminum foil and place a wire rack (I use a cooling rack) on top. Spray the rack with non-stick spray. 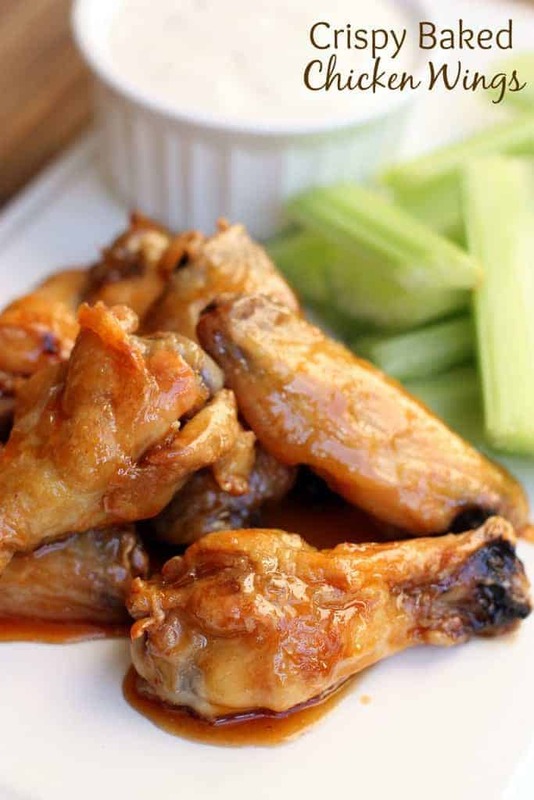 Use paper towels to pat the wings dry and place them in a large bowl. Combine the baking powder and salt and add to the bowl with the wings, and toss to evenly coat. Arrange wings, skin side up, in single layer on prepared wire rack. Bake on lower-middle oven rack for 30 minutes. 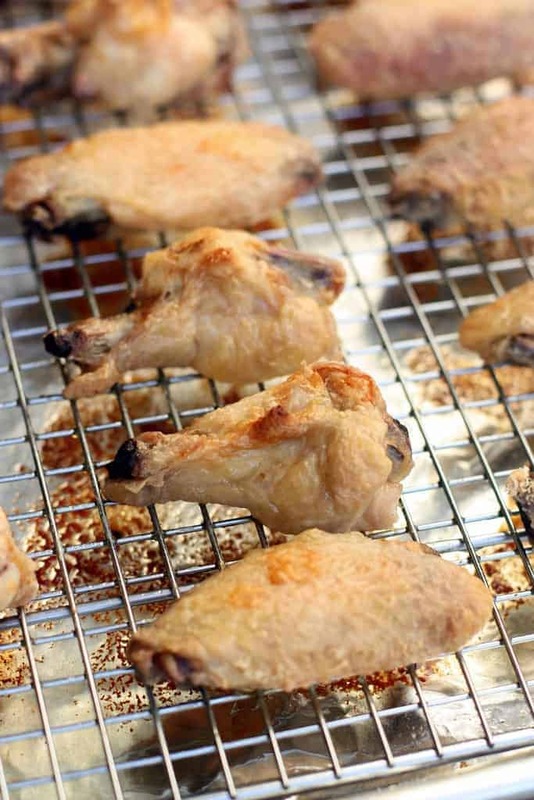 Move wings to upper-middle rack, increase oven temperature to 425 degrees F, and roast them until golden brown and crisp, about 40 minutes longer, rotating sheet halfway through baking. Remove from oven and let stand for 5 minutes. Transfer wings to bowl and toss with sauce. In a medium saucepan over medium heat stir together all sauce ingredients. Mix well until sugar has dissolved. Remove from heat and allow to cool to room temperature before adding to wings (or prepare the sauce ahead of time and refrigerate). Looks yummy and delicious, can’t wait to try this chicken recipe for my family. Thanks for sharing! I wonder how the baking soda verse Baking Powder work out What would the taste of so much powers?